It’s almost mid-March, and if you are anything like me, your New Year’s resolution to “eat healthier and exercise” has come and gone. Well, it’s time to refocus and National Nutrition Month sponsored by the Academy of Nutrition and Dietetics offers the resources to help us do just that. 1. Preparing a healthy and balanced meal is overwhelming and lonely. 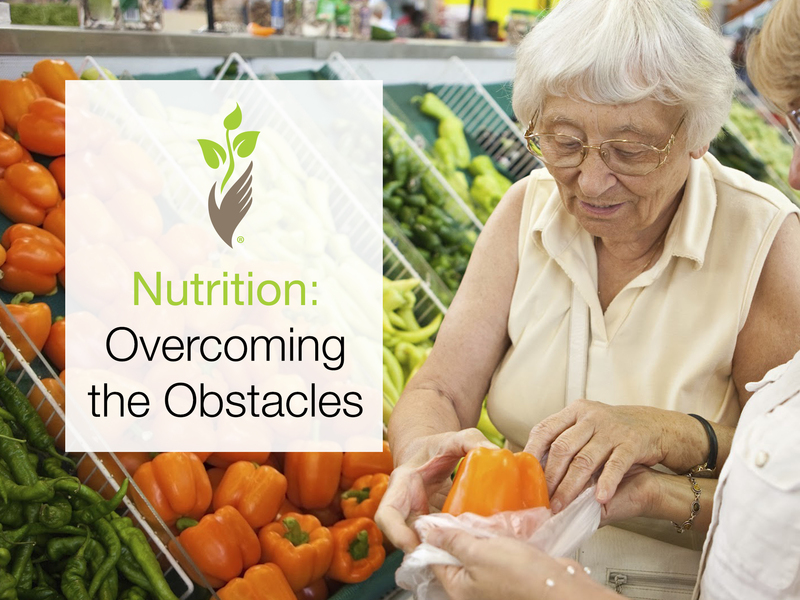 As seniors age this can be the number one obstacle in maintaining optimal nutrition. Proper nutrition requires planning and asking for help when necessary. Schedule meal dates with friends and families. Family members can set up a schedule to drop of health meals. Preferred Care at Home provides meal preparation and companionship. For just a few hours a day a reliable caregiver could come to your home, prepare breakfast and lunch, and leave dinner in the oven to be enjoyed later. 2. You’re appetite has decreased. If you notice a loss of appetite and have difficulty eating an adequate amount of food throughout the day, contact your physician. The first thing you should find out is if a medication you are on or a combination of medications is contributing to your loss of appetite. 3. You have difficulty chewing. Eating fresh fruits, vegetables and lean meats can feel nearly impossible when it is difficult or uncomfortable to chew. Adjust your diet to compensate but to still include healthy food. Eat smoothies with protein powder, cook or mash your fruits and vegetables, incorporate lean ground beef/turkey and eggs into your diet. If you have dentures, visit your dentist to make sure your dentures are properly fitted. 4. You have difficulty shopping. It may be difficult to maintain a stocked kitchen and pantry if you no longer drive or if you find going to the grocery store on a regular basis exhausting. Ask your family members to help you once a week or even every other week with major grocery shopping. Preferred Care at Home provides incidental transportation and assistance with errands such as grocery shopping. If you are struggling with a long shopping trip, ask for the help you need. If you feel stuck with your meal plan, it may be a great time to work with a Registered Dietitian Nutritionist. If you suffer from heart disease, diabetes, chronic illness, or struggle to maintain a healthy eating routine, a nutritionist is an essential member of your health care team. This month, don’t let the obstacles you face stand in the way of your health. If you need help with meal preparation, grocery shopping, incidental transportation and more it may be the right time to contact a Preferred Care at Home location near you.